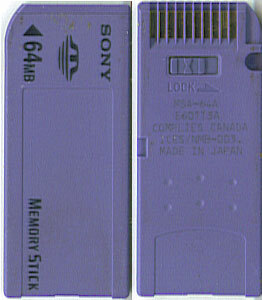 Français : Memory Stick de 64 MB. Norsk bokmål: For- og bakside på en Memory Stick. Русский: Memory Stick 64 MB. Slovenčina: Memory Stick 64 MB - Pohľad spredu a zozadu. Українська: Карта Memory Stick спереду і ззаду. Source Transferred from en.wikipedia to Commons by User:Wind using CommonsHelper. Ce document provient de « https://fr.wikipedia.org/wiki/Fichier:Memory_Stick_Front_and_Back.jpg ».